We don’t walk in anyone else’s shoes. We can’t know or bear anyone else’s burdens. We don’t feel anyone else’s pain. We can only know our own. And that being said, because we all have burdens, it should never be a competition…i.e., my pain is worse than yours or I learned my lessons faster than you have, etc. Our journeys on this planet are unique to each individual. When I weigh out my troubles during prayer time, I am often overwhelmed by the ripple effect that our actions have on other human beings. I am aware that when I allow my personal struggles and fears to fog my eyesight, my behavior changes: less open, less empathetic, less loving. I also know how it affects me when others treat me in a closed, judgmental or hateful way, its like a punch in the stomach making it harder to bounce back. In response, I am continually refocusing my prayers to help me include bringing openness, empathy and love to all people, specifically to combat the growing deficit of these qualities in the world. I know all change begins with me. I decide the tone and tenor of my journey on this planet and it is my belief that being open, empathetic and loving will have an even bigger ripple effect than being closed, judgmental and hateful does. When I start at this small level I can build up the skills necessary to bring out the big guns when I need them. What do I mean? Becoming skilled at being open, empathetic and loving has changed my whole perspective, hope begins to thrive and my own burdens become significantly less. A simplistic solution, I know…that’s why working hard on the simplest circumstances help gird my loins for the tougher circumstances. Knowing the back story of a truly vile person that is rooted in the most tragic of circumstances does change the level of judgement that I have about them. It has to. If I am trying to evolve as a person…IT HAS TO! It doesn’t mean that people who break the law get a free pass, or people who make bad choices don’t have consequences. It does mean that when I respond back to them in an open, empathetic and loving way…I take control of the situation and that is where the truth lies. I learn a lot from friends of mine who are defense attorneys. They hear another side to the story. They stand for people who have made mistakes, or who truly haven’t, all of whom need help facing a complex system. They advocate fairness in a way that the world outside the justice system does not (OK an aside here, I am not referring to the inequities of the present justice system…just for the importance of hearing the other side of every story). I also learn a lot from friends and others who are counselors, pastors, doctors, etc. who hear the “other” sides of the stories we would like to bypass so we can feel comfortable in smug judgments. I am also privileged to hear many stories that have staid the hand of my own judgment of others in my own life. What I know is this: most people are not inherently evil, most were taught to hate (I have to be truthful here, I say most because the jury is out on some who actually are evil in my mind…but then I am a work in progress). And when you offer openness, empathy and love in response, they do react differently. Change has to start somewhere. “Stop judging, that you may not be judged. For as you judge, so will you be judged, and the measure with which you measure will be measured out to you. Why do you notice the splinter in your brother’s or sister’s eye, but do not perceive the wooden beam in your own eye? How can you say to your brother or sister, ‘Let me remove that splinter from your eye,’ while the wooden beam is in your eye? You hypocrite, remove the wooden beam from your eye first; then you will see clearly to remove the splinter from your brother’s or sister’s eye. “Do not give what is holy to dogs, or throw your pearls before swine, lest they trample them underfoot, and turn and tear you to pieces. “Ask and it will be given to you; seek and you will find; knock and the door will be opened to you. For everyone who asks, receives; and the one who seeks, finds; and to the one who knocks, the door will be opened. Which one of you would hand their children a stone when they ask for a loaf of bread, or a snake when they ask for a fish? If you then, who are wicked, know how to give good gifts to your children, how much more will your heavenly Father give good things to those who ask him. “Do to others whatever you would have them do to you. This is the law and the prophets. “Enter through the narrow gate; for the gate is wide and the road broad that leads to destruction, and those who enter through it are many. How narrow the gate and constricted the road that leads to life. And those who find it are few. “Beware of false prophets, who come to you in sheep’s clothing, but underneath are ravenous wolves. By their fruits you will know them. Do people pick grapes from thorn bushes, or figs from thistles? Just so, every good tree bears good fruit, and a rotten tree bears bad fruit. A good tree cannot bear bad fruit, nor can a rotten tree bear good fruit. The lesson here is clear: spend less time judging, help is always available, and the only acceptable judgement is determining who the wolves are by the fruits that they bear. This morning I was thinking about forgiveness and empathy, and the general lack thereof in the world. While I was pondering this notion, a nasty bug crawled across my path and I smashed it…yeah, the irony hit me right away. Where was the forgiveness and empathy in this knee jerk response? Of course I told myself that it was just a bug that had no place on my counter, that it was no big deal. Perhaps it wasn’t. But for a moment, I focused on the impulse I had when I saw the bug; I hated it, it was disgusting, I wanted to get rid of it and frankly, its death was of no consequence to me. It was that visceral reaction that caused a bit of an epiphany. I realized that my response to that bug, although microcosmic, was probably close to the reaction that a lot of people have to that section of the population they simply can’t empathize with because they hate them, are disgusted by them, want to get rid of them and their death is really of no consequence to them at all. So often our lack of empathy is a result of a knee jerk response, programmed early by some uncomfortable experience. While the leap from insect to race, class, gender, ideology, nationality, or religion may seem huge…isn’t it really just a magnification of that same kind of automatic response? The Kingdom of heaven may be likened to a king who decided to settle accounts with his servants. When he began the accounting, a debtor was brought before him who owed him a huge amount. Since he had no way of paying it back, his master ordered him to be sold, along with his wife, his children, and all his property, in payment of the debt. At that, the servant fell down, did him homage and said, ‘Be patient with me and I will pay you back in full.’ Moved to compassion, the master of that servant let him go and forgave him the loan. When that servant had left, he found one of his fellow servants who owed him a much smaller amount. 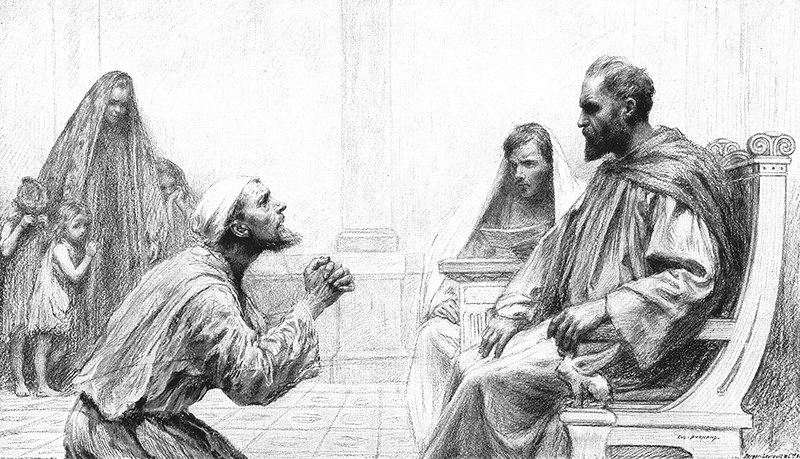 He seized him and started to choke him, demanding, ‘Pay back what you owe!’ Falling to his knees, his fellow servant begged him, ‘Be patient with me, and I will pay you back!’ But he refused. Instead, he had him put in prison until he paid back the debt. Now, when his fellow servants saw what happened, they were deeply disturbed, and when to their master and reported the whole affair. His master summoned him and said to him, ‘You wicked servant!’ I forgave you your entire debt because you begged me to. Should you not have pity on your fellow servant, as I had pity on you?’ Then, is anger his master handed him over to the torturers until he should pay back the whole debt. So will my heavenly Father do to you, unless each of you forgives your brother or sister from his heart. Today, let’s all work together to quell the knee jerk response that comes before the choice to empathize and forgive…life will be so much better as a result.